There was also a bookclub edition of ENGINE...not sure how many Centipede titles had that additional distinction, but I don’t believe it’s many. I did not know that - thank you! I've added a note. I am the proud owner of Jerad's personal copy and I have the ORIGINAL letter that King wrote to Jerad (you pictured)...This copy I own comes with ALL the correspondence between CP and King's lawyers to get this book published and I have one of only 4 copies of the Shining Pitchbook that was created in the hopes that King would authorize Jerad to do an S/L (he was shot down). The value of this set is "market price" and my set won't be for sale until the time comes for me to liquidate my entire collection (shudders at that thought). What is more....I also own what I believe to be another state of this book (not signed) that few people even know about...no pics will be made available....this Salem's Lot special internal copy made a very very brief eBay appearance several years ago as a CP insider sought to sell his copy but he abruptly closed the auction (I was told that Jerad was livid he was selling so he pulled the auction). I and at least one other member here emailed the seller saying we were interested in the book...over a year later, the seller contacted me out of the blue saying over the coarse of the year he completely vetted me to make sure I was the "right" person. He sold me his copy. I know of no other person who has a copy other than Jerad himself. ***ADDED after viewing full thread....I see that Bob Jackson owned a copy too apparently so maybe my "extra" is not as special as I thought (but it is I guess if Bob owns a copy....). It is the slipcased black spine copy just to the right of the Betts rebound page blocks. One of the items you didn't mention (unless I missed it) was the issuance of a number of unbound page blocks. I still own one of them but I have no idea how many were issued. I know a number of the were rebound beautifully, though. Just thought I'd mention them. Also, any idea how many packets of pictures were issued? I don't know how many unbound page blocks were issued but I know that this happened for several books and will try to note it when applicable! I also don't know how many packets of pictures were issued. If anyone has this info I will include it as supplementary information in the original post. 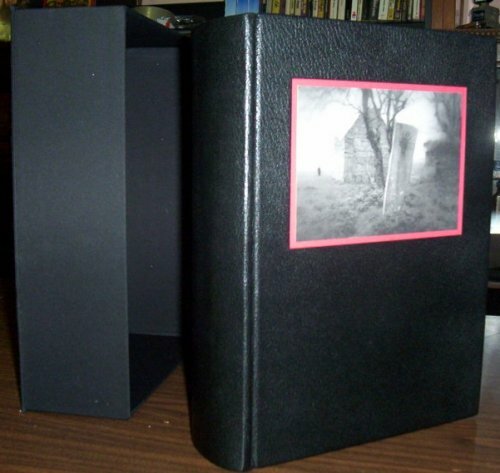 Regarding the page blocks this is the dedicated Custom Bound Salem's Lot thread that puts my speculation here to shame. Worth checking out, if you haven't! Whichever designation you prefer is OK but you might want to reconsider the issue price. The clasped version by itself was initially offered at $7500. If one was purchased as part of a package for $12,000 it wouldn't be accurate to assign the entire total to just the clasped version. UNBOUND PAGES.....when I bought Betts Books from Stu late in 2009, I got about 40 sets of page blocks from Salem's Lot...they were all Gift edition page blocks (without the illustrations). Over the next several years I tried to sell these page blocks, starting at $150 and finally offering at $50...eventually there were no takers or interest (I think most of these originally came from George Beahm). I held them a couple more years and then (CRINGES) disposed of all but two copies. 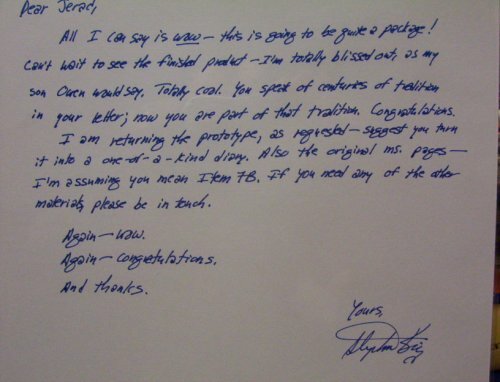 Those I gave to Jerome so he could create his special Salem's Lot rebound books. 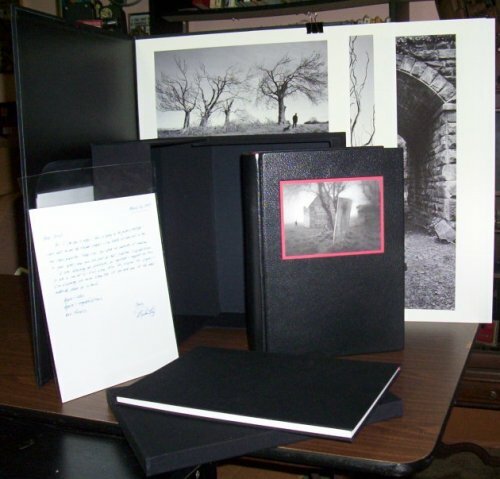 well, pictures of the Jerad personal copy are already posted when it was for sale...it's the pics with the letter and all the extras...the supposed "secret" book i see in the repost of Bob Jackson's Salem's collection...it is the shorter slipcased one (black spine, reddish top to slipcase) to the right of the two rebound versions. I had the bookclub edition in my collection, but gave it away in the hopes that a true 1st would come my way as a replacement, but several years later no such luck. 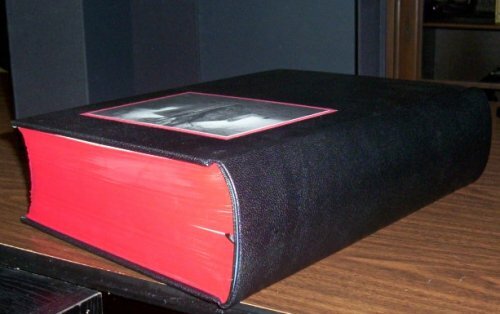 WOW - congrats on acquiring such an important book! And all the correspondence...! And The Shining pitchbook...! I'd love to get my hands on one of those someday - good to know that there are three other copies floating around, though I imagine they all currently have loving homes that they will be reluctant to leave. I didn't realize that there were so many book blocks - at least a good number of them were turned into beautiful aftermarket books. And the "secret" book is very interesting! Perhaps a prototype for the gift edition? Only got the 'Illustrated' trade version for 'Salem's Lot' but I still thought it was a beautiful production and I liked that they made the deleted scenes available to the public. I own the 'Knowing Darkness' and while it's huge and not something I'm going to be opening up again and again it was nice to see the art in such a fashion. I think Bernie Wrightson's art was what impressed me the most, his artwork for 'The Stand' has a lot of detail and linework that the trade versions didn't do justice. That's interesting that your blocks were the gift edition. I always thought that the block I purchased from Jared was an unsigned version of the limited. I sold it to John years ago, so he would have to verify that. Perhaps Jared eventually sold blocks of both versions. The page blocks were from the SL edition. I stand corrected...I don't have any anymore, was going from memory....Jerome would know cause I sent him at least one if not two copies. Very interesting thread! Thanks, Lotuz! Please keep on posting here! The fourth book published by Centipede Press is another collection of stories, essays, and art, much like Stigmata, and again, with no explicit underlying theme related to the title. 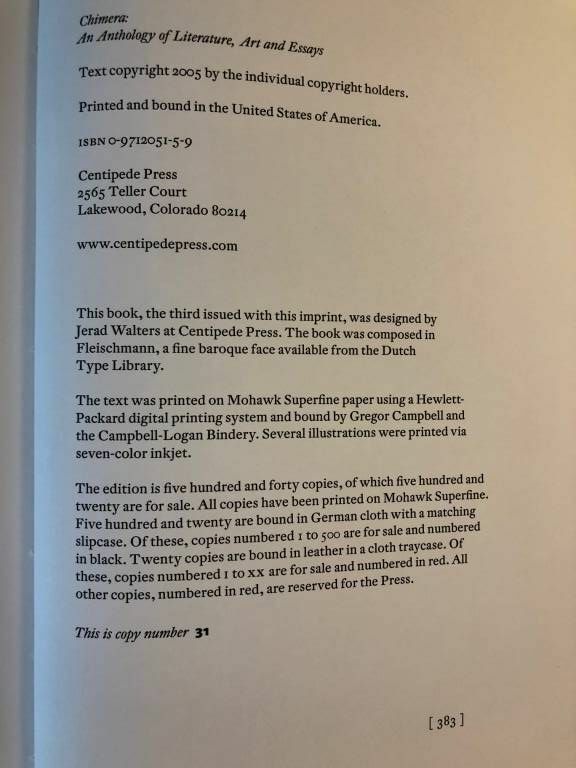 The limitation page states that 540 total copies were printed, but once upon a time the Centipede Press website listed 200. 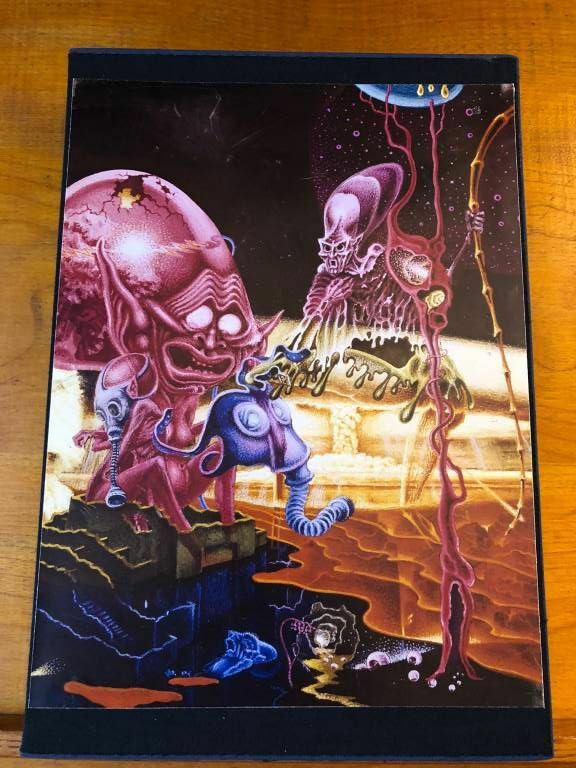 I’m inclined to believe the limitation page over the website, but this is one of the rarest Centipede Press titles out there, so I’d be pretty amazed if there were a full 500 copies. There were still copies of Stigmata for sale a decade after the release but this book pretty much never sees the secondary market. However, it’s also a more beautiful book than Stigmata IMO, so maybe there really are 500 copies out there and all are in happy homes. 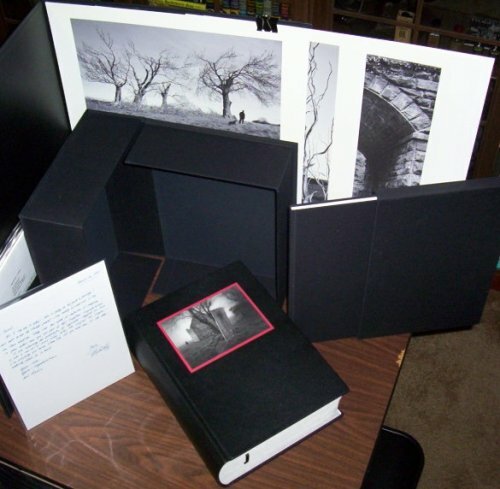 The limited version came with a slipcase, and some number of the initial customers (not sure how many) got to choose which art from the book they wanted printed and affixed to the slipcase, so there are an unknown number of different slipcases out there. You can see a little bit of rubbing to the sides of the print on my slipcase – this is one of a number of CP titles that I couldn’t turn down because it comes up so rarely, but that I ultimately hope to upgrade one day. I don’t know if the same was true for the traycase for the leather bound version – I’ve never seen one, or heard of one for sale. The book is bound in a fine German cloth – I’m not sure what the style is called, but it’s shot through with lighter threads and has a more interesting and distinctive look than the plain black cloth. It’s also two-tone and has a chimera stamped on the front board, in black! 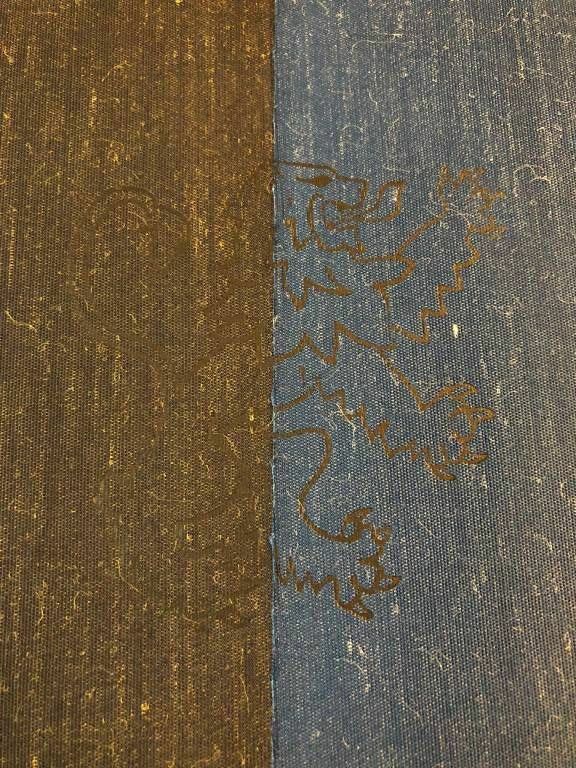 The two-tone cloth is hard to pull off, logistically, and in the close-up of the chimera you can see some minor fraying. 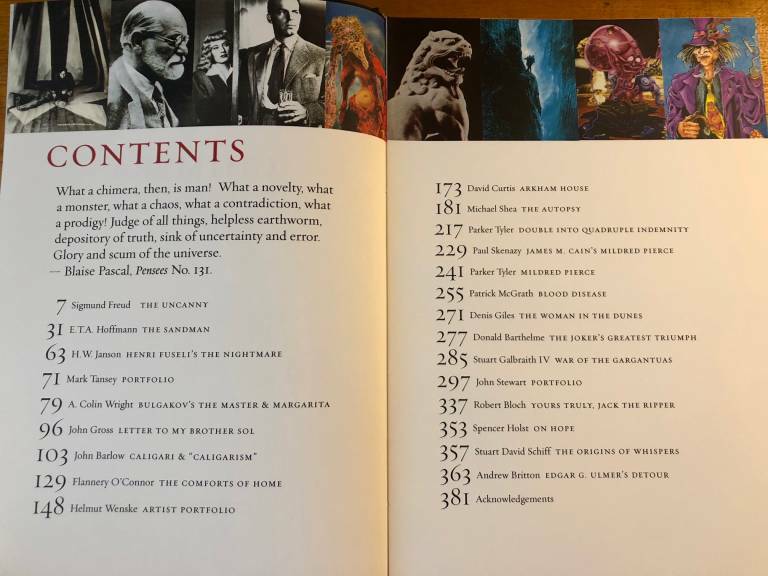 Here is a shot of the contents – you can see that it has quite the range of topics, ranging from an essay by Freud, to a Flannery O’Connor story (one of my favorite authors, so this was a treat), a Robert Bloch piece, and a number of artist’s portfolios. David Curtis, who wrote the introduction to the previous CP book (Two-Handed Engine contributed a piece about Arkham House. Helmut Wenske would later be featured in the CP release of The Golem. Michael Shae’s story “The Autopsy” would become the feature piece in a collection of his work, appropriately titled The Autopsy and Other Stories. The artist portfolio of John Stewart would also later be expanded into a book. The limitation page lists all the editions that were created. Note that the limitation number was printed on the page – this is the first book where the limitation number was printed rather than handwritten. This technique became the standard for all later CP books. There are a couple of advantages to this. One is that some of the numbering can become very creative (we’ll see examples of that in the future; one of my favorites is for the Kane series, which is a while away, but in the meantime we’ll cover several entries in the Studies of Horror Film series, which also has some good ones). The second advantage is that there are no unnumbered PC copies. For almost all CP books, the full print run is known and is stated on the limitation page. 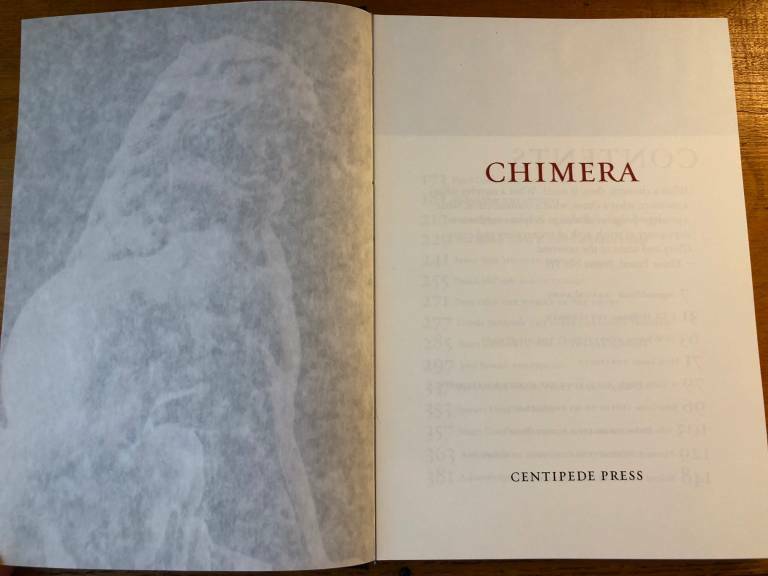 The contributor copies of Centipede Press books are designated by Roman numerals, and are listed on the limitation page as well. There are usually 20-25 total, sometimes in red, sometimes in black. The disadvantage to this system is that if a book is damaged in transit, it’s a big deal to get your number replaced. 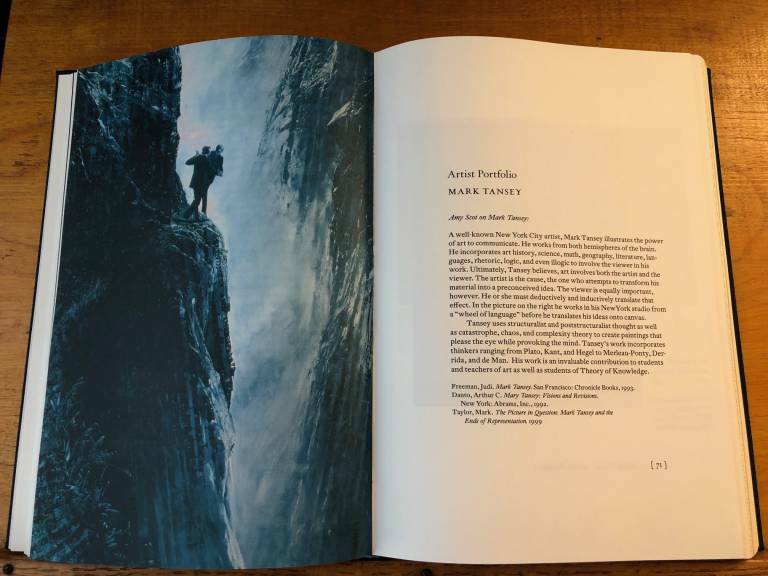 The limitation page has to be excised from your book and tipped into another copy, which in turn has to have its limitation page first excised. Fortunately, CP books are packaged very well – I have only had one book arrive damaged, and that was because the outside packaging was pierced with a long skinny rod of some sort (fortunately only the slipcase was damaged). 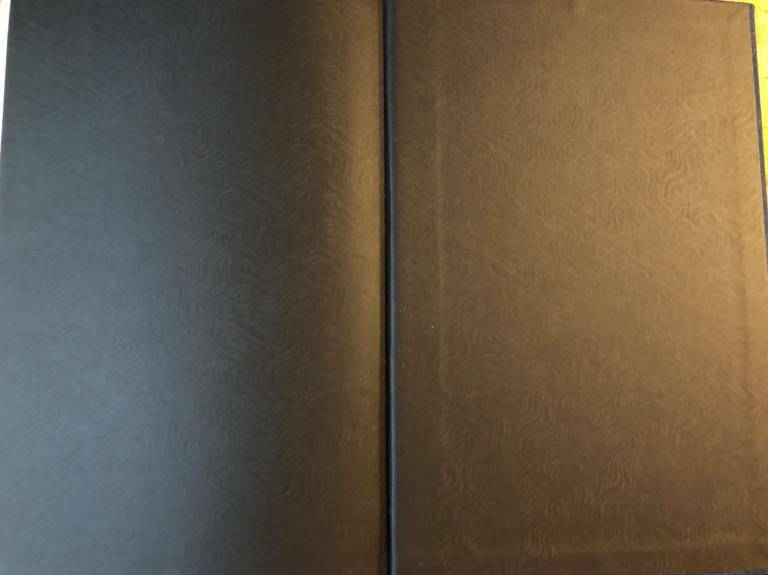 Here is one last shot, of the endpapers – the same textured black as Two-Handed Engine. Up next is the very first Studies in Horror Film, a neat idea for a group of books that are still being published today. That's the one pictured in PostMortem 2. Do you have those? EDIT: Also, do you mean this book in general, or this copy? PostMortem was his early brochures. Then he sent out ones called Centipede. I'll have to see if there was another after that. He also sent out just e-mail info. At some point he went to the newsletters. Not sure when - have almost 300 emails from Centipede. I don't think I can attach to a PM, but if you PM me your email, I will send what have to you bit by bit. I think you will enjoy - some not just his books, but articles, book reviews, etc. Also do you have Rue Morgue, issue 76, March 2008. If not, pick one up! Hey thanks, Lotuz, for starting this thread. Very informative. Longtime member and fellow CP aficionado Lurker has been sending me some of the earliest Centipede Press newsletters, and this has allowed me to make some updates to the very earliest entries. I'll add a short post about each update. Note: the rest of the month is really busy for me so the updates will come over time and also I reduced my goal (temporarily) to one book per week for the remainder of September. This is the most impressive thread on the site in my opinion take your time! You already blew me away. 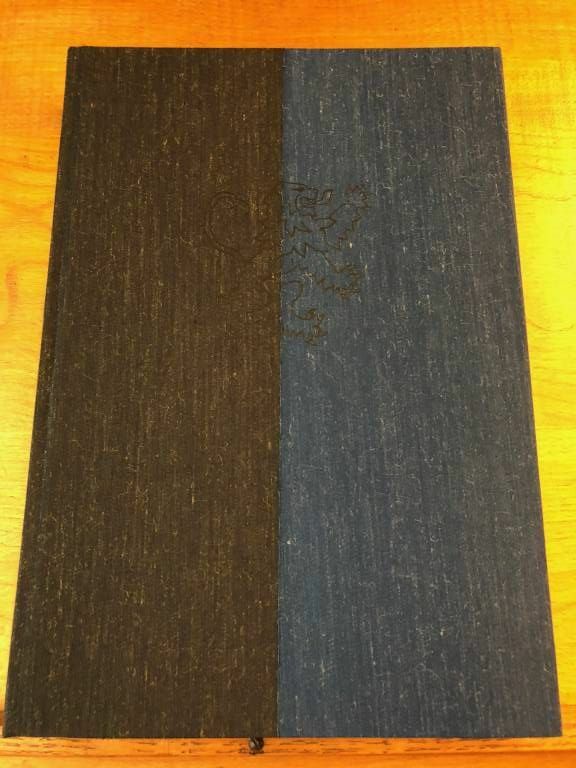 It turns out that although there are some limitation pages that mention a "deluxe state" but are bound in cloth (see original post here), an unknown number of those pages were bound into actually superior bindings: leather bound and in traycases. Based on information from Post Mortem #2, from February 2007 (kindly supplied by Lurker), there were at least 5 of them (because that's how many were left for sale at that point), originally priced at $750. 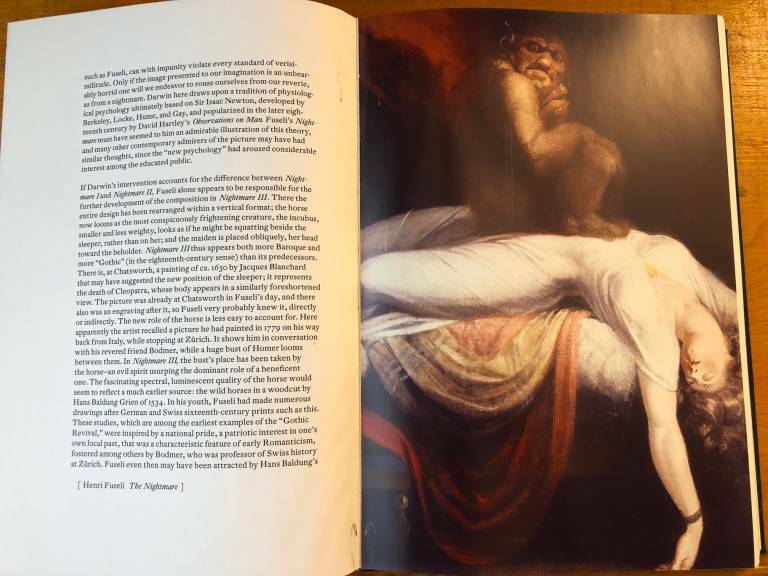 And there was even an option to purchase a large (4' tall) framed print of the inset artwork (Oedipus and the Sphinx) with the book for a total of $3000. Needless to say, I would love to see pictures of this edition and/or the print. I've added the deluxe state as "1.a" and moved the other states down a letter (the cloth states with limitation pages are now 1.b.i and 1.b.ii and the cloth state with no limitation page is 1.c). 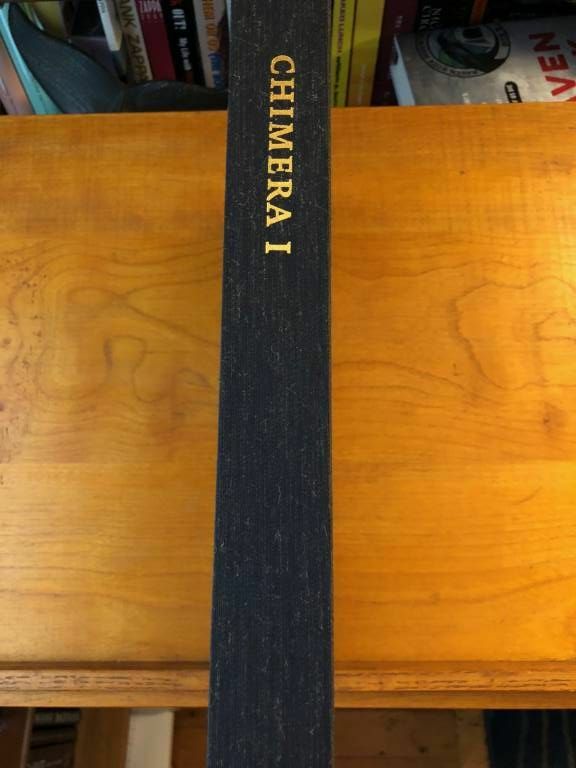 The print doesn't warrant a separate state because the book is presumably the same, but is now mentioned in the post. Fortunately for me, there is an amazing amount of information about the next release ('Salem's Lot) on this site, and I don't think I missed any official states of that book. Also it was definitely sold out by the time the newsletters I now have started (November 2006). But I'll have updates to Two-Handed Engine (an additional state) and Chimera I (some confusion with Chimera II on my part, as well as a tyographical innovation that I missed but that plays an important role in a later CP release (interesting I know )) in the next few days, as well as the next entry at some point this week. I own all but a handful of Centipede Press titles (including about 10 Deluxes) and am looking forward to seeing what surfaces in this thread. Thanks. And feel free to let me know what Deluxes you don't have decent photos of; I can provide them if they're ones I actually own. My goal is to post pictures of every state that I own, so if I add a new post and it doesn't have pictures of the same book(s) that someone has in their collection, please feel free to add them to the thread or to PM me! !